Wordshark includes everything that primary school students need in order to achieve their spelling targets. It’s perfect for any age or ability, from Year 1 students struggling with EAL to the gifted and talented in Year 6. The program has enduring appeal – students enjoy the variety of activities and reward games, and the program is easy to use – both for teachers and for students. An ‘add and manage students’ area means that there is a clear recording system for each student, showing progress but also highlighting any areas of difficulty. Work can be set for each student so that the teacher doesn’t have to be present. To save time, individual students can also be grouped together in Wordshark and work set for that group. Wordshark course – a general spelling course starting with letter sounds and simple words, which continues systematically to long, difficult words. There’s also an option to choose a phonics approach. ‘Letters and Sounds’ (English phonics) – follows week by week progression for ‘Letters and Sounds’ (English government synthetic phonics scheme). 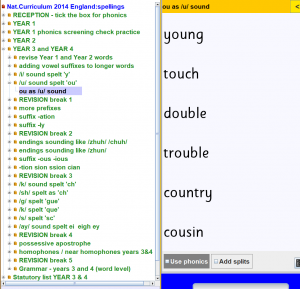 Curriculum 2014 England: spellings – follows the English government’s spellings for KS1 and KS2 – including the statutory lists, and practice for the Year 1 Phonics Screening Check. ‘Alpha to Omega’ – follows the progression found in the book ‘Alpha to Omega’ by Bevé Hornsby and Frula Shear. Everyday vocabulary lists – useful for EAL. Set 1 has the simplest of greetings, colours, numbers etc. Set 2 introduces extra words and simple sentences. Set 3 provides many more words and uses them in both simple and more complex sentences. Alphabet and dictionary course – practises single letter sounds and names. It also practises the alphabetical ordering of letters and words. High Frequency Words (HFW) – gives comprehensive lists of common words most often needed for children’s reading and writing. I am a teacher in a mainstream primary school. I use Wordshark and Numbershark with the children in my class who have literacy difficulties and/or number difficulties. I have found that even children currently on p scales (I teach year 2) can access the program and make progress. I find that because of the simple interface these children learn to work independently on the computer and this enables them to progress without extra teaching assistant support which is often difficult to secure. The program moves them on in the their learning because it gives them exercises at their level. The letter tracking (and number recognition in Numbershark) games are particularly good. I think it is the best program I have found. The progression is fantastic. So the program starts at a very basic level suitable for children working towards L1 and it continues to secondary level. They use NC and letters and sounds units – makes it fit perfectly into the class work that I am teaching. I cannot recommend it highly enough.